3-D Mini Golf brings the challenges and thrills of the popular outdoor pastime to your computer. The goal is the same as the real-life version: drop the ball in the hole in the least number of hits. To do this in each of the more than 50 thrilling stages in the game, you´ll have to drive the ball over hills, down drops, and through traps and other ingenious obstacles. You might get better as you go, though, since 3-D Mini Golf can improve your hand-eye coordination and sharpen your focus. 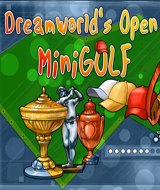 3D Mini Golf offers two game modes: Court and Campaign. The object in the first is to complete the current hole within the set number of hits. If you exceed the limit, you´ll lose and will be asked to try again. In the second mode, there´s no limit to the number of times you can hit the ball, but if you swing your club too many times, you won´t make it into the 3-D Mini Golf Hall of Fame. Competition will be fierce, too, as people of all ages will enjoy this realistic and easy-to-play rendition of one of the best casual sports ever invented. Comments: If you like putt putt golf you will like playing this game fun for all to play. Didn't find anything real bad at all with the game. Would be great for anyone. Comments: It's mini putt-putt galore you try to sink it in to when. But there are traps, windmills and more to try to get around for the whole in one. This is a great family game for all.